Flying beside the American Flag this Veterans Day you’re likely to spot another national icon: the stark black symbol for prisoners of war and those missing in action. Designed in the early 70s, the POW/MIA flag was part of a national movement by families during the Vietnam War to resolve the fates of missing service members. In many parts of the country, the symbol is ubiquitous, even though the last decades of American conflicts have seen practically no POWs. To a younger generation of veterans for whom prisoners and the missing dead are no longer a part of combat, the POW/MIA flag’s symbolism is shifting away from the literal and toward a feeling of having dropped out of the national consciousness. 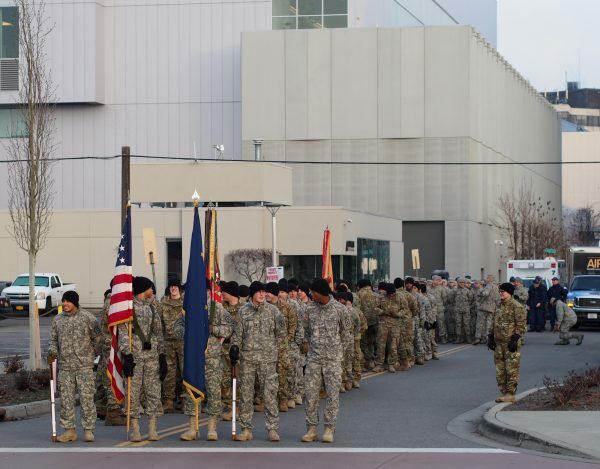 It was 26 degrees on a recent Saturday morning in downtown Anchorage as members of the Service High School band shifted from foot to foot trying to stay warm as they clutched their instruments. 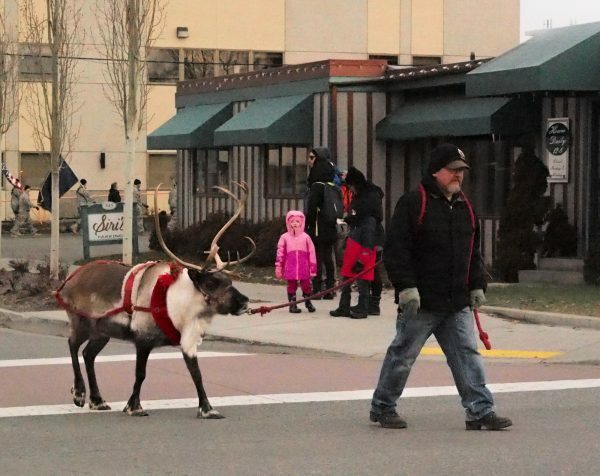 Clad in green jackets, the teens were bringing up the tail of a parade for veterans, followed a stilt-walking clown, a reindeer on a leash and a cadre of older bikers. Flying from the back of their motorcycles is the black POW/MIA flag, with a white silhouette of a young man trapped behind wire and a menacing guard-tower. The text underneath read ‘You are not forgotten.’ The image is everywhere: Patches, flag-poles — there’s even a Dodge Charger with a paint job of the somber emblem covering the entire side. According to Woody Quackenbush, the vehicle belongs to someone from nearby American Legion Post #1, where he is a member. 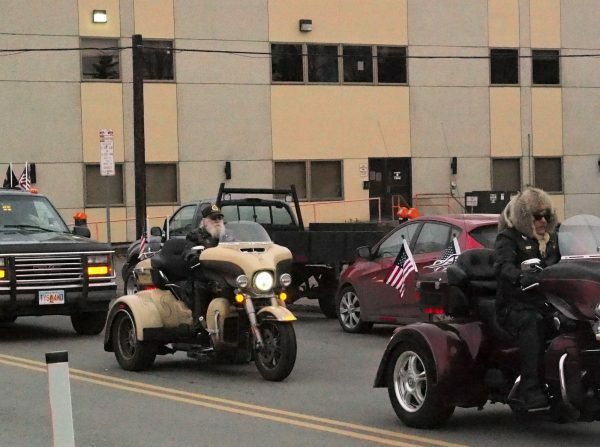 “During the Vietnam War and stuff they’d send people out on patrol, they didn’t know where they were,” Quackenbush said, his long gray beard hanging down toward his beige three-wheeled hog. In 1962, at age 17, Quackenbush enlisted in the Army. In his view, during and after the Vietnam War, the POW flag was a way to draw attention to soldiers the government didn’t work hard enough recover. Officially, as of September of 2017 there are still 1,602 Americans unaccounted for from the Vietnam War. That’s a lot, but it pales in comparison to past conflicts where neither the science nor the will was in place to recover the dead. From World War II alone, there are 72,977 service members still listed as missing. But this accounting of warfare is becoming extinct: since 1986 through the wars in Iraq and Afghanistan, the total number of service-members left un-recovered by the military is six. 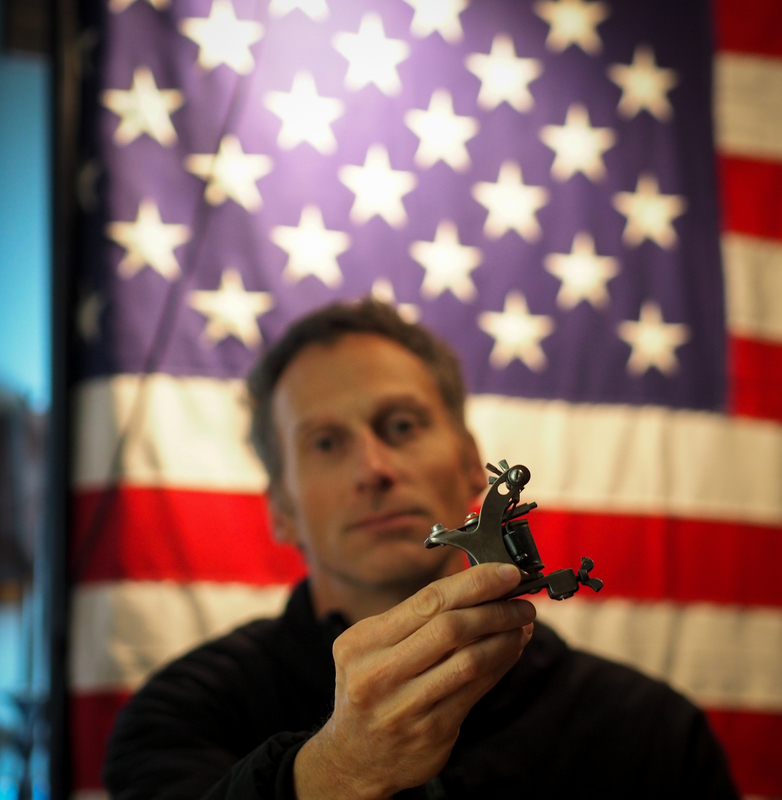 Roger Sparks recently retired from the military after more than two decades serving as a Marine infantryman and later a pararescue jumper, having deployed to some of the most rugged parts of Afghanistan. Now, he works as a tattoo artist at a studio in Eagle River. “The conflicts that we’re fighting now, it’s not an atmosphere that you’re being held captive,” Sparks explained, sitting in the garage he’s converted into a home studio, filled with art, movie posters and the large, curling horns of a doll sheep skull. Sparks is a highly decorated vet who did a total of ten combat tours. And according to him, for many younger veterans the POW flag no longer stands for the literal absence of comrades held behind enemy lines or lost in the battlefield. “I almost view that as, ‘Well that’s their era of symbolism,’” Sparks explained. “I can really identify with the severity of their experiences, but I don’t feel I have ownership of that,” Sparks added, referring to older sentiments toward the POW flag. Sparks grew up in Texas surrounded by Vietnam vets, men who tended to have been drafted and generally went on one combat deployment. Today’s volunteer military is made up of people more similar to Sparks, with multiple combat deployments accrued during military careers. Compared to the Vietnam era, Sparks sees the country’s relationship with its recent wars as marked less by fervent support or opposition than general indifference. Part of why he thinks the POW flag resonates today with so many veterans, service-members and families is less for the silhouetted young man behind barbed wire, than the words below about not being forgotten. When Sparks started tattooing guys in Afghanistan, they’d sometimes sit down to do sessions right after returning to base from pararescue operations. Sparks described it as almost like a ceremony to process what they’d experienced. There, and in the time since, no one’s asked for the POW insignia.